Khushaal Yadav, who passed out from AIIMS in 2014, has cleared UPSC civil services exam in his first attempt and secured 28th Rank. He says he benefited from InsightsOnIndia website during his preparation. He will be sharing his strategy for this exam with you. In the below article he has shared his views on Personality Test conducted by UPSC. He is awarded 201 in the Personality Test. 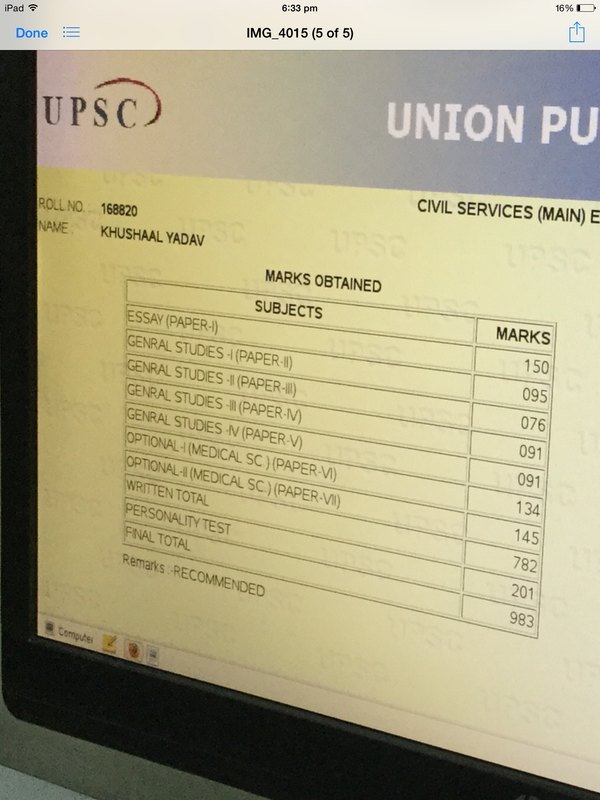 The UPSC has finally disclosed the interview and mains marks. More than 775 in mains and over around 175 in PT (Personality Test/Interview) is must for harboring any hopes of getting in the administrative services. Of course, there could be outliers who will defy any sort of analysis. Back in the graduation days we used to have theoretical exams and practicals including viva-voce. It was then that I realised the importance of the ‘Interview Skills’. It goes without saying that one needs to have a respectable knowledge of the content before presenting ones viewpoints, but there are certain skills and a particular attitude that can go a log way into making the PT one of your strong areas. I did not do great in the content aspect, meaning my answers were not extraordinary but being well prepared mentally and being presentable helped me score 201 and make the cut. It compensated for a below par 782 in the Mains that I managed. It is the most essential aspect in that you are being tested for your communication, presentation, thinking, reasoning skills which are sine qua non for a prospective Officer. Imagine you are already in the job. Say, you are in a meeting with hot-shots , or addressing a Press Conference. How would you act then? This is in brief what your PT is all about. To express yourself directly, soundly, and convincingly. One does not become an orator overnight. It requires great deal of patience, practice and proper guidance. It is true for any other field. Getting into a proper shape- physical or mental is time consuming, but its a frame of mind worth getting into. 1)IMAGINE yourself to be into the fabled corridors of the UPSC and being escorted to the interview board. Anticipate it. The walk, the churning of the gut, that rush, that chill down the spine. 2) Mirror, mirror! Tell it all!! Practice speaking before a mirror. Write down questions on a chit and draw them randomly.Think for some time, formulate your thoughts, get the necessary phrases, anticipate the possible counter questions that might follow and respond in a calm, controlled and confident manner. 3) Summarise– after reading say an article of the HIndu or the IE, close your eyes and try to summarize it in say a 100 words, recapitulate the key words. This helps not only in memorisation but also helps to avoid verbosity and brings about brevity in the responses, a desirable trait in an officer. 4) V-LOGS – Alternatively, you could record yourself and analyse the clip later, with or without friends. This helps to identify Gestures( facial/bodily), Slips of tongues, stock-phrases, Beating around the bush, tone, pitch, pace, etcetera. An indispensable exercise to master the movements of the tongue and make them fluid, seamless and purposeful. 5) Learn from the best– Turn to presenters from the BBC, Al- jazeera, CNN; world leaders- Barack Obama, PM Modi ji, Putin, Cameroon; Speakers who have honed the craft of story telling. This is in short what it is. Telling them a tale and keeping them spell-bounded. Additionally, this helps you to stay abreast with the changes in the world, to say the least. Upcoming Post– What NOT to do in the Interview?? Next story 1) Despite global appreciation, Israel labelled the recently concluded nuclear deal between Iran and six world powers as ‘stunning historical mistake’. Critically examine the historical reasons why relations between these two countries is not good.